web cast. It made it easier for us to enjoy Brock's experience, knowing he was in such capable and caring hands of you and your team. If at any time you are in Vancouver, please do not hesitate to call and visit if you have the time. Hi I am not sure where to send this just want to congratulate Matt and Loren on their great achievement!!!!! Wow Matt now you must really feel like Indiana Jones what a adventure you had and there is still so much to come Love mom and dad. To: Rochelle and Steven of CVS and all the other climbers. I just got the news of your arrival at the top a few days ago. I'm excited for you that you made it to the top. Congratulations! Enjoy the climb down and the Safari. See you real soon! To Sheena, Cherry, Tanya and Susan  we are so proud of you!!! 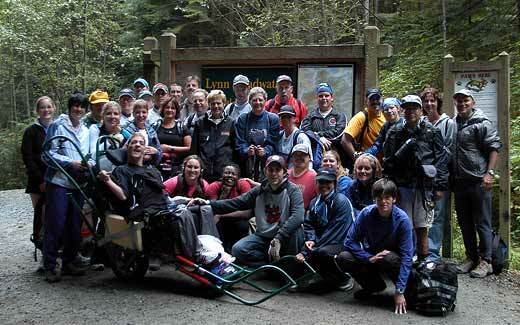 Everybody here has been following the climb daily and are touched by your challenges and your spirit. The real heroes in our community are the people who take on these challenges and the four of you took it on with courage and strength  you guys are our heroes. We look forward to your return and to hear all the wonderful stories of your journey and adventure! WE LOVE YOU GUYS! Wally, I just wanted to write and congratulate everyone on the success at Kilimanjaro. I have been following the cybercast and I am just blown away by the accomplishment of these climbers. That mountain can be brutal on the most gifted, let alone adding additional challenges. I know a tremendous amount of planning, work and heart went into this climb. We are all inspired. I hope this climb will be shared with everyone around world. It is truly deserving. Thanks for letting us all share in the experience. Hi Rocky. This is a big hello! from Uncle Joe and a bigger congratulations! I was not that surprised that you made it, one, because you are stubborn and.....I'm kidding a little. You must have a tough bunch with you also, so pass on my congratulations to all your co-climbers! This is one instance where it pays to be a little stubborn. I am pleased that you are reading this, because it means you didn't trip or try to take a short cut down, or that you didn't try to toboggan all the way down .No I'm not crazy, I just thought you might be in a hurry to get back down! Oh, by the way, I just talked to Allan on the phone and he told me that because you liked climbing so much, he entered your name in a contest where you can win a free spot on a Mt. Everest climbing expedition. Unfortunately, if you win, you will only have three or four days to rest up when you get back. If this happens, you can tell us about both trips at once because you will be too busy packing for Mt. Everest for us to visit you .Good Luck! ((((((((((((((hugs)))))))))))) Love and stuff from your old Uncle Joe. See, even I can be serious when I want to! Hi Sweety. CONGRATULATIONS! You did it and of course I knew you would. You must feel like an angel, so far above the clouds. And you are to take on a challenge and reach your goal as you did. You put in a lot of rigorous training to get there, and there were probably times you wondered if it was worth it, now you must be very proud! So you should be. We have all been cheering for you! Enjoy the rest of your adventure although it will all be pretty tame now. Luv you and see you soon. Just wanted to say that I had the pleasure of meeting Matt Mackay when I visited Canada in 2003. His Mum Linda and I have stayed in contact since then and she alerted me to the fact that Matt was on this climb. It has been a wonderful experience to read about their adventure and see the smiles on their faces. I am very proud of Matt and all the other climbers. Thanks for sharing this adventure with us all. Please pass this on to Rochelle and Steven of Community Ventures Society  We love you guys to pieces! We are so overcome with pride and love that you made it to the top! As Bogart would say, "you rock our world"! Rochelle, I will pat the dogs for you! Steven, you are the man. We love you guys. CONGRATULATIONS!! To every member of the BCACL team, WAY TO GO!! To the Prince George team from AIMHI, all of Prince George is so proud of you!! It seems everyone I speak to is aware of the climb, and is cheering you on. To Marc, my dear husband, words can't describe how proud I am of you. I can't wait to speak to you and see you in Vancouver, but you have so many more adventures ahead of you... enjoy them. We'll wait! Ella, Morgan and I are doing well. WE LOVE YOU! Steve and Cory, you guys ROCK! We are all so proud of what the two of you have accomplished and have watched your accent up Mt Kilimanjaro with great emotion. You are great ambassadors for what individuals who have disabilities can accomplish and now the whole world knows what we have known for a long time. Your spirit and determination is inspiring and thank you for letting all the self advocates at NSAMH climb with you in spirit. Way to go girls!! We've all been checking on your progress everyday. Then we get together at our gathering place & cheer you two on. Kudos to the both of you. Trina, you so inspire me!!! We will see you soon. Have a great time on the rest of your journey. From Faye Gutierrez, Rochelle Paquin's mother sending this email from Prince Edward Island. Hey, Rochelle, everyone here on PEI is so very proud of your endeavor-Dean and I most of all. What you have done is something greater than anything any of us mere mortals have ever dreamed of. Every day when I come home from work I run to the computer to see where you are and what you have done, and I actually cried when I read this today. Curtis and aunt Sharon and uncle Joe are just as excited as we are and send their love and long distance hugs to you and everyone on the team. Dean wants to know if you had a snowball fight-he says there's no point in going to the top of the world if you don't have one. We love you and wish you all happiness for the rest of your adventure--and remember--lions like hard crunchy outsides (jeeps) with soft chewy insides (humans) Love and great good wishes for all. Your VERY proud mom. What a fantastic accomplishment Jan and Ray. I have really looked forward to the updates and am so stoked that you made it to the summit. I hope you have taken lots of pictures to share with us back in Vancouver. Enjoy the Safari. Great work for a great cause boys!!! We look forward to seeing ya soon. It is so unbelievable to see our guys up there on that mountain! We've had so many comments and questions from our community. This has generated more interest in our work and our agency than anything else we've done in recent memory. I spoke with Matt's (MacKay) Mom this afternoon and she's just so excited about what he's accomplished. She says that Matt has reached his goal by getting to the crater. For whatever reasons the crater was of extreme interest to him and there he is! I have to say that I think the MacKays, and other parents, are very brave. I cannot imagine the strength it takes to encourage your disabled son or daughter to take this giant step into the unknown, many of them with comparative strangers. One of our CLBC workers phoned this afternoon to say that she watches for every update and finds herself between laughter and tears. The most exciting thing for me is the real sense of community that's portrayed in the communication from the mountain. Wally Berg has an incredible way of describing this and it's made even more powerful by the fact that it's live and you can actually hear the wind, etc. in the background. WOW, what an incredible experience for all of us, not just the climbers but those of us at home living vicariously through them. I also think about the hundreds of people in communities across the province who worked so hard to get this in place. It really is a most unbelievable and awesome accomplishment. We're so proud of Matt and Loren! Hi BCACL Team and BAI support, this climb embodies the essence of Community Living: reaching for the possibilities for any and all of us requires the acceptance, support and enthusiastic cheering of a whole community. Your challenges and accomplishments have touched us all here, in BC, and around the world. Every climber on Kili will be telling the BCACL story, speaking with pride at being on the same mountain with such an inspirational group. Just how moving the daily accounts are caught me by surprise. So, with tears and a smile, my very best to you. Congratulations!! You are the living proof that by determination and good support, one can accomplish anything in life. I have known many people, fit and willing to climb but who gave up going to the top of the beautiful Kilimanjaro. Well done!!! Congratulations to the parents as well, you have done so well to encourage your children to go beyond, what most of us would think (wrongly) impossible to do. I am Matthew Brewer's BIG sister but he is my HERO!!! No dream is too big, no goal unreachable...what an amazing and inspiring team! You carry our spirits with you to the top of all your mountains! We love you, Matt! Few things have moved me in my life and reading and hearing about the adventure of a life time that you are on is one of them. Goose bumps and misty eyes have been the order of the day after some of Wally's reports. I had the honour of meeting alot of the team when they were in Powell River training, I wish I had gotten autographs then, all I did was transport stuff for them. I knew what they were doing but it did not really sink in. Until I see what they have had to go through does it really mean anything, I have had the honour of meeting heroes and that will stay with me the rest of my life. To all the team and Janet and Jenn from Powell River love ya. xox What is next???? Feb. 16th. You have reached the top. Congratulations to you and the team for the accomplishment. Another milestone of your many achievements. We have been watching daily with your progress. Be careful. Watch your steps on the way down. You've accomplished so much. We are so very happy and excited for you. It's been wonderful being able to experience your adventure vicariously throught the internet. Have fun now on your safari and a safe trip home. Gord said don't be so camera-shy Kim and get in a picture. We have been following your amazing trip every day and marvel at the significance of this climb. Your trip is truly an inspiration for everyone and will charge us to do more than just dream. By working together we can change to world. I have told fellow members of Freedom From Harm, a self-advocates committee of Community Living Ontario about this adventure and shared the link. We hope the TV show will be available in Canada so more people can see and hear about the power of community and teamwork. Maybe folks from BCACL will consider coming out to Ontario to share your stories with us. Salamu, and CONGRATULATIONS to you on your wonderful accomplishments!!! You have no idea how many “happy tears” you have precipitated in so many places over the course of your climb. The ripples of your achievements are already spreading far and wide. Folks here in Prince George are ever so proud of you, and we are very inspired by everything you have done  or rather, by who you are. And what a TEAM, what a COMMUNITY you have been up there on the mountain! Your journey together represents some of the very best of which we human beings are capable. Sincere best wishes to you as you journey on. We can hardly wait to see you back here at home  but don’t hurry, savor every moment and every step you take in Africa. Kwa herini! Congratulations Ray & Jan, What an amazing accomplishment! Enjoy your well-deserved safari. YOU GO GIRL! When I heard your voice on the Feb. 14th's dispatch, I too had tears of joy within my eyes. You are amazing. Love ya, and YOU GO GIRL! Hope you are having the time of your life. WOW! You won't believe that buzz that is going on around the town here. People are asking about how you are doing, we are sharing the updates to lots of tears and cheers. Seeing your pictures yesterday just made it all so real and we can see that you are working hard and having an unbelievable time. Everyone was relieved to know that Don is okay and will be rejoining the group soon. As far as we are concerned it makes no difference how far up the mountain anyone went, you had accomplished everything we could hope for when you arrived at the first camp. We can hardly wait until we can hear about it in person and will be waiting anxiously for the updates tomorrow. We are really proud to have been part of such a successful trek. We also feel that we are part of something way bigger and have been enriched by participating; I guess that is what community living is all about!! \Seen your picture on the internet. We are so proud of you and all of your fellow team members. You look like you are having a great time. Love you and miss you. Way to go Don  We're still rooting for you from Sudbury & London. It was great to see the picture of you & your partner on top of the mountain. Mom, Dad & Kathy, have all been watching too. We all think you've done a great thing. I know that it must have been difficult for you to halt your progress to the top. We are still very proud and would never want you to risk your life. You are much too important to us. So now you can just hop on that crazy carpet! Did you pack it? lol, Love from the whole crew. Have fun! Way to go! You'll be on the top of the world just about now. Wish we were with you. I saw a very proud and happy Tracy at Safeway this morning. She is very excited and wants to know every thing about the trip. I wish you and all the group continued success for the rest off your trip. We have been following you everyday and sending positive thoughts your way. We are so very proud of you. We new you could do it. The first thing that we would do in the morning was turn on the computer and see where you were. Wish you all a safe and happy return. P.S. Eric we love the beard. A big congratulations to Janet and Jenn from Powell River on reaching the top.. our thoughts and Best Wishes are with you all the way.. you have done as proud......Congrats to all BCACL team members, you are all Olympians in our eyes. This message is for Tony, Don, Colleen and Danise. You have had all of us on the edge of our seats while you have been on your amazing journey! The pictures are so awesome and you all look so happy and healthy! We are so very, very, very, very proud of you! You have bravely gone where few of us would even dare to dream about!! All of Kamloops is buzzing about how proud they are of you! We miss you and are so looking forward to seeing you home safe and hearing all about it! Angela sends hugs and kisses. Deb has had goose bumps for the whole time, we have all been constantly checking for the latest news! The first picture of Colleen and then of Tony and Don brought a loud excited cheer from everyone in the office. The Team pictures all looked so great. As you prepare to Summit tomorrow . . . Go Team Go!!!!!!! Congratulations to Jan and Ray on reaching the summit! We’ve been anxiously reading the updates every day and everyone clapped and whistled here at the office when we heard that they had reached the top. Now they can relax and enjoy the view and the upcoming safari. We look forward to hearing their stories in person when they get back to Vancouver. Way to go guys for being the first to reach the summit  congratulations!!!! Congratulations to all of the climbersyou have all undertaken an amazing challenge and accomplished an amazing feat  we are both so very proud of all of you. The excitement and memories of this adventure will last all of you forever. Congratulations again and we are beaming with pride. Looking forward to hearing all about it Jan and Ray when you return. Hi Guys! Yesterday Ernie gave me a copy of the photo of the both of you standing side by side .I was so happy, proud and excited by your accomplishment, I swear my heart skipped a beat. I look forward to hearing all about it when you get back; well after you have showered! You both look like such seasoned world-trekkers!!! Kudos to you all! A special hello to Kim and Gerry. We're following your footsteps up the mountain and very proud of your accomplishments! On behalf of the Board of Directors for Powell River Association of Community Living, I would like to congratulate the team effort that you have all displayed during your climb to the top. I would like to especially congratulate Janet and Jennifer you have made us all very proud remember to keep safe on you journey back. After taking in Wally's audio today while on top of Africa with Brock it reminded me of why I want him to take me to the Top Of The World. I cried a tear or two. We are Jan Mareel's power lifting coaches Gerry & Leta. We are very, very proud of Jan, and look forward to hearing all of his great stories when he returns! Congratulations too, to the others that have made their attempt to conquer Kilimanjaro! Congratulations from the bottom of our hearts to the top of Mount Kilamanjaro!!! Each day I get the new post and cry tears of happiness at all of your accomplishments of reaching higher ground everyday; then I call Mom and read her the wonderful report, and tell her about the magnificent pictures, Laney you looked so great walking on sunshine having the time of your life along with everyone else; the reports Wally has made have been so great felt like we were there with you and we are in spirit! You climbers are fantastic and I'll look forward to seeing you at the airport on your return. Have a wonderful time on the safari. Congratulations again to all of you!!! Just wanted to let you know that I've been tracking your progress recently and wanted to wish you all well on your adventure. It's an incredible accomplishment and a huge precedent-setting event for people with disabilities. Your success will prove fruitful to the on-going awareness and equity campaign for persons with disabilities and will prove to be inspirational for generations to come. Apart from those benefits, many positive, life-changing experiences and memories will result for every individual involved. I look forward to hearing more of your journey. Best of luck to everyone and thank you for your adventurous spirits! We are the parents of Matthew Brewer, one of the disabled climbers. Tracking the progress of this great adventure on your website has been our main focus since the team arrived in Africa. When we think of Matthew nearing the top of Kilimanjaro, we can't help thinking back to his first solo steps at almost 4 1\2 years old. We give thanks for his progress through the years and rejoice in his accomplishments. We are sure the parents and family members of all the disabled climbers must have these same feelings, and we give a great cheer to all the BCACL climbers and the Berg Adventures people including the Tanzanian porters, who are providing such superb support to the climbers. We are bursting with pride at your accomplishments. We have known Eric Anderson and Ron Berg for 10 years being there coaches in Special Olympics. It is so great to see what you guys are accomplishing, keep up the great fight to reach the top, we know you can. Enjoying all the updates on the hike, it is a great idea. Can't wait to see the pictures and hear the stories when you return. Good Luck the rest of the way. Congratulations to all the climbers and supporters who are doing so well in their quest for the top. I am in awe of the dedication and love of life’s moments that I see in the faces of the participants. It truly shows us that all people have abilities when undertaking and reaching for what is sometimes thought of as an unattainable goal. To Matt MacKay........We unlucky people that you left behind in Chilliwack are all very jealous and wish we were climbing that mountain with you!!!! Hope you will tell us all your stories when you get back and don't tire the big guy out too much. Take care and keep trekking. A big hello to everyone up on the mountain! A very special hello to my work colleague, commuting partner, Naramata Committee member and friend, Nancy Hoyano. It was so great to see your pictures throughout this trek. You looked like a team from the beginning. Your statements throughout your journey bear out how we can work together to overcome obstacles, and more importantly how we can live our wildest dreams if we have each other for support. You are all so very inspirational. All the best tomorrow as you climb the peak! I'm totally out of this world reading and following every minute of your climb! I'm totally blown away at your determination, hard work and teamwork just to accomplish this mission! You all have moved me to tears as I follow on your ascend! Your community teambuilding to put all this together is most inspiring! I even called Shelley to speak to her about you all! Keep up the good work all of you! I as a matter of fact will be following your footsteps next week. I'm climbing with breast cancer survivors from Canada, US and UK as well as supporters to fundraise for breast cancer. I shall hope to meet you all at some point in Moshi! You all are just awesome! Good luck and go slowly...polee...polee! Joe and I are following the progress of the climb with great pride and excitement. I hope your client is well and enjoying himself. I know there will be memories forever, and a gift of self-confidence of a quality that will remain unique, although he and you go on to other adventures. It's a thrill to see the photos and read Wally's descriptions. Our very best, and prayers of gratitude for everyone. From John Stewart of Hamilton..
Wally, my brother, you have done it again; you have brought me to tears of emotion. I have been following your dispatches daily with great interest. I am right now sitting in my office in Hamilton, reading your latest dispatch and I have tears rolling down my face. I know of the emotions your team is going thru and I share that with all of you. I wish I were there with all of you. You each should be congratulated and all should be extremely proud. Please give my best to everyone there, although we have never met. Also please give Brock a high five for me. Say hello to Leila and Nicholas for me. My name is Liesl and I live in Prince George  my brother Matthew Brewer is one of the climbers and I have enjoyed all the updates and being able to track the teams progress via this web site. I must check the site at least 7 or 8 times a day waiting for more news! I was very excited to tune in yesterday and get to see a picture of my brother trekking his way up the mountain! I am so very proud of him and all of the climbers  they are a constant inspiration to so many people. It has been an incredibly emotional week for my family, as I am sure it has been for all the climbers families, and I watch in anticipation for the team's next successes! Thank you for all your great work on the web site! I enjoyed your pictures of people climbing the mountain. It looks magnificent. Jen and Jan I hear you have made it to every camp so far and you make us proud. Everyone looks very happy and pleased to be climbing the mountain. Everyone here at Free Spirit are watching for your news everyday and sharing a bit of your experience. Larry is with me now and says a special Hello. Continue to have a great trip! Hi to Don Matthews from his sister Terri. I am watching each day on the computer your trek up the mountain. I am learning new things about Africa from watching the progress and am very proud of you. Isn't it funny you're climbing a mountain, and I am still flat on my back! Lol. Keep up the great work (Tom says Hi) Love you lots! I am so glad that you have put this email address up as I was looking for somewhere yesterday to email my comments. I have worked for Langley Association for Community Living for almost 15 years now and know Kim Bucholtz very well and Gerry London I have grown to know a bit more as they worked so hard to train for this climb. Now I have the opportunity to email, I am lost for words!!!! Everyone here at LACL, as we all call it, are following the climbers progress. It is amazing that from so far away we can follow their climb. The dispatches coming in are very exciting to read and we listen to the audio as well! The pictures are wonderful. It is a very emotional experience for us down here on the ground, so we can only imagine how the climbers are feeling. We are all so proud of everyone doing this climb, but particularly Kim and Gerry as they are so close to our hearts. It cannot be anything but a life changing experience for all of the climbers. What a wonderful picture of Brock and the dispatch from Wally Berg describing the look in Brock's eyes  the eyes they say are the windows to the soul and tell you so much about what someone is feeling. Thank you to ALL who are making this possible for the climbers and for everyone involved in getting the daily dispatches up on the web. We all miss Kim and Gerry here and are very excited and looking forward to their return to hear every little detail about this wonderful experience. The goal was not only to reach the top of Kilimanjaro, but to tell the world all about community living and the wonderful people we all support and what they can achieve and boy are they doing that! I said I was lost for words  but I seemed to have said plenty. From Carrie Batt..."I had to reread everything twice"
This information is so inspiring and so fabulous I wanted to make sure I got every word. This adventure brought tears to my eyes and got me all inspired rather re-inspired. Know I am going to spread the good news about this trip a big congratulations and many applauses to each climber. Wow amazing stuff. …well now you've done it! I'm all teary-eyed again. Wow!, Eh?! Our entire (VERY large) family is in awe. Thanks for the web updates and photos--treasures to all of us. Your Feb 14 dispatches brought tears to my eyes, your group is so amazing! The group from the Community Living Show on Co-op Radio is keeping track of your progress so far. We think that it brings attention to what the disabled can do when they want to. We are hoping to have some of you on the show to talk about your experiences on the other side of the globe. Both Dave & I are thinking of you and are keeping other self advocates in the know. KEEP IN TOUCH! OOGABA!! Hey guys. I just figured out how to post the comments on the web page other wise I would have sent out a message earlier. Just want you to know that we're all keeping track of your progress and we're looking forward to each and every daily report. We received the team photos of you just about 1/2 an hour ago and you guys look GREAT!! All the hard work is definitely paying off. We just want you to know we're all proud of you, especially us Support Climbers. I can't wait for you to get back and fill me in on your adventures and to get my hiking partners back! Cindy has been forwarding the live feed reports out daily so everyone can follow. We miss you lots and want you to know we're super excited about your progress! Happy and Safe Hiking!